Grado SR80i review | What Hi-Fi? You can't have everything. Sometimes, when it comes to hi-fi, those pesky ‘laws of physics' come along and smugly insist that it simply can't be done. Compromises just have to be made. In this case, we're referring to the sonic performance of headphones, and what can – and can't – be achieved in terms of real quality: clarity, detail, naturalness, fluidity, transparency, etc. The fact is, headphones are used for private listening. Which means most models utilise a closed-back design, which keeps you from inflicting your music on those around you. But this design also creates a plethora of internal reflections, enclosure vibrations and standing waves – all of which are seriously detrimental to sound quality. So, what's to be done? Well, it's to Grado's great credit that it decided to answer that question with a method of mind-boggling simplicity: make open-backed headphones that leak sound like there's no tomorrow but which, as a result, sound sublime to the person wearing them. And it's not as if these colander levels of leakiness are their only idiosyncrasy. With their retro-looking ear-cups attached to a leather headband via a short metal rod, they look for all the world like a headset for a 1950s shortwave radio. But the SR80is have a serious point. And that point is how they sound – sharply timed, awesomely detailed, musical, natural and – with the right recordings – simply beautiful. Don't take them on the train with you: the person next to you will hear every single note, and, let's face it, not everyone likes Michael Buble. 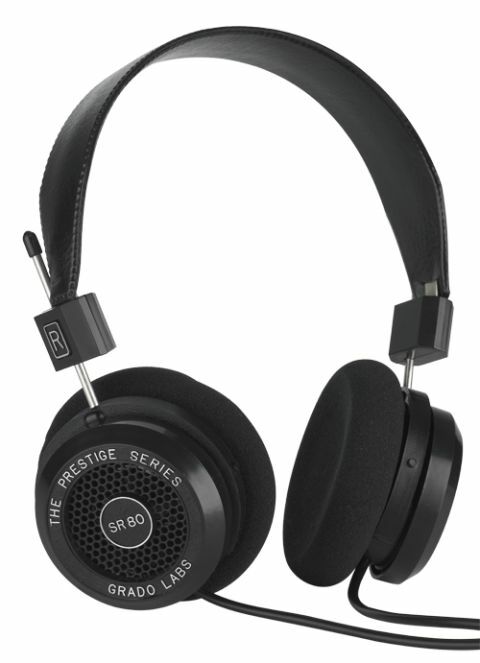 But, for home listening where it won't bother the spouse, the SR80is are simply a stupendous buy for £110. Sound per pound? You betcha.